Applications are invited to apply for the latest Askari Bank Limited Trainee Officers 2019. Askari Bank is looking for trainees in all cities of Pakistan for their bank branches in all cities of Pakistan. Both men and women of Pakistan are welcome to apply and join this banking organization with Pakistan's reputation and make their future successful. You have to apply online for the internship management officer. This is for fresh graduates with previous experience required. Minimum 4 years Bachelor of institutions recognized by the Higher Education Commission. At least 3 CGPA of 4 or minimum or equivalent. You have to Apply Online. No applications will be received without online. All procedures will go through online applications. The link to the online application is below. Department of Special Education Punjab Jobs 2019 Current openings. Requests are being made by the Punjab Government Special Education Department for the ADP Plan 2018-2017, 2016-2017, 2015-2016 in Lahore, where there are multiple publications available and the list of vacancies is provided below. Applicants who meet the criteria must submit a handwritten application along with certified copies of the education certificate, experience certificate, driver's license, address, CNIC and recent photographs should arrive at the following address listed then. The last application date is May 05, 2019. Submit a separate application for each publication. Government / Semi-Government employees must apply through the appropriate channel. Applications incomplete or received after the closing date will not be considered for the selection procedure. How to request verification works of 2019 documents? 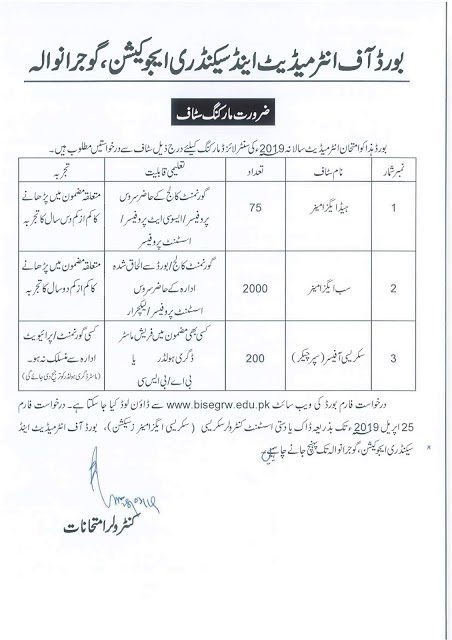 Department of Population Welfare Punjab Jobs 2019 Last Vacancies. The reputed department of Punjab, which is called the Population Welfare Department, is seeking to recruit qualified, professional candidates who work hard and fit for the ADP Program "Multisectoral Population Welfare Program, Punjab (2018-20) "and the following positions must be filled as soon as possible. The applications along with the required copies of the educational certificates, certificates of experience, diplomas, address, CNIC, three recent photographs must arrive through certified mail to the following address listed below. The requested position must be clearly mentioned on the envelope. The last date for the presentation of the application is April 30, 2019. Applications received after the due date will not be considered and will be rejected. Candidates who are already working in the government sector must apply through the appropriate channel. Only pre-selected candidates will be called for the test / interview. The ZTBL 2019 works are applied online Zarai Taraqiati Bank Limited. ZTBL (Zarai Taraqiati Bank Ltd.) is one of the well-known banks. Currently, this reputed bank is looking to recruit highly educated, experienced, hardworking and disciplined candidates for the following positions detailed below. ZTBL jobs are (Deputy Vice President (AVP), Grade I Official (OG-I), Grade II Officer (OG-11)) are vacancies based at the Islamabad Central Office and must be filled as soon as possible. Interested candidates can apply online through www.ztbl.com.pk. The last date for the presentation of the application is April 28, 2019. No TA / DA will be admissible for interviews. Last Date to Apply: April 28, 2019. 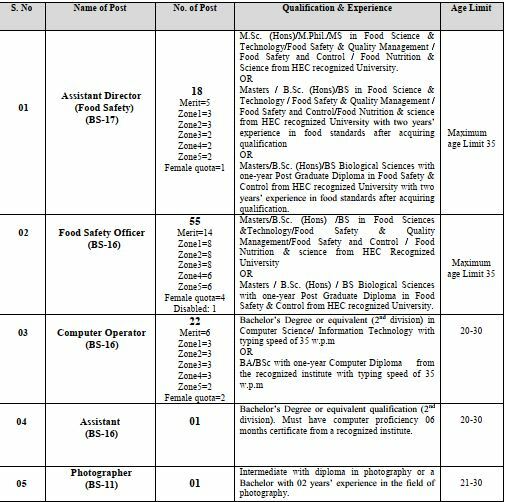 Food Safety and Halal Food Authority KPK Jobs 2019 PTS Test & Sample Paper. 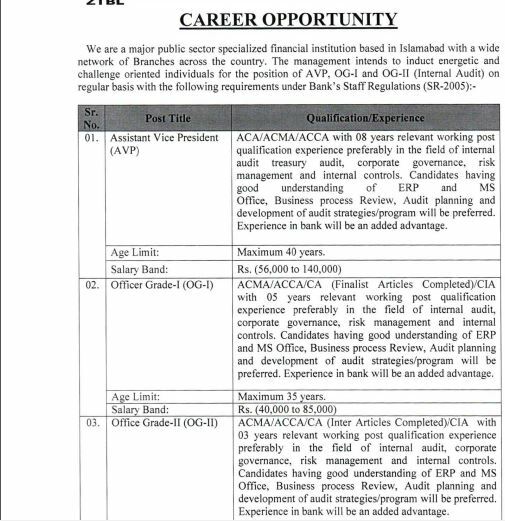 For all KPK residents, here is one of the wonderful job offers of the Food Safety & Halal Food Authority. KPK is trying to designate candidates well disciplined, caliber and skillful. , Nowshera, Swabi, Upper Dir, Lower Dir, Malakand, Buner, Tank, Lakki Marwat, Hangu, Haripur, Mansehra, Chitral. The following publications are indicated below. Interested candidates should download the application along with proof of deposit from the PTS website www.pts.org.pk. The form duly filled out with the deposit receipt paid and the copies of the education and experience certificates, the CNIC must contact that address. The name of the applied position must be clearly mentioned on the top of the envelope. The last date to apply for employment of Halal Food Authority KPK is April 30, 2019. For Apply & Download Form " Click Here "
Today I will tell you about the work of the Bank of Punjab, in which all those in Punjab can apply for this job. The Bank of Punjab BOP is one of the fastest growing banks in Pakistan, with a large network of more than 576 online branches across the country. How to apply Bank of Punjab Jobs 2019? Interested and willing applicants are required to download the application form from the official site of NTS or from the given link below. Duly filled application with paid deposit slip should be paid in favor of NTS and should be submitted to the said address. The NTC Jobs last date for applying is April 30, 2019. Address: NTS Headquarters G-5/2, Islamabad.